The Quartet for oboe, violin, viola and cello F-dur KV 370 (KV 368b) was composed in 1781 in Munich for Mozart's friend a Mannheim oboe player Friedrich Ramm.The quartet consists of three movements. The first is a joyous Allegro with string trio sometimes accompanying oboe and sometimes contrasting it as a consolidated group of instruments. The movement begins with the canon of all four instruments, and then violin now and then enters dialogue with oboe as in reprise. The second movement was written as a moving Adagio. There's a fermata in the 31st bar which implies a small oboe cadenza. The Finale is written as Rondo and there's an amazing example of polyphony here In bars 95 - 108 the strings continue to play in 6/8 while oboe plays virtuoso passages in 4/4. In the first movement and in the Finale Mozart several times introduces F of the third octave into the part of oboe thus being one of the firsts to expand the range of the instrument. 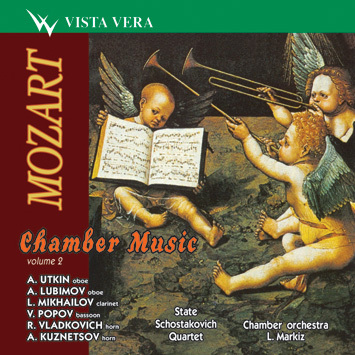 Quintet for horn, violin, 2 violas and cello Es-dur KV 407 (KV 386c) was written in 1782 for a horn player Joseph Leutgeb - more as a concerto than a chamber ensemble. Horn and violin bear the main thematic load while other instruments mainly accompany them. Such use of the ensemble probably goes back to the old Concerto grosso. Quintet consists of three movements, Allegro, Andante and again Allegro in the Finale. Earlier editions include also minuet and trio borrowed from the Serenade. Sinfonia Concertanta Es-dur for oboe, clarinet, bassoon and horn K anh (KV 297b) was written in April 1778 in Paris for flute, oboe, bassoon and horn. Mozart intended to perform it at the Concerts Spirituels which was a very prominent concert organization in France . On April 5 1778 Mozart writes to his father: "I am going to compose Sinfonia Concertante for a flute player Wendling, an oboe player Ramm, , a horn player Punto, and bassoonist Ritter. All of them are Mannheim musicians with the exception of Punto who is a travelling virtuoso." In the late April Mozart passed the score over to Joseph Le Gro, the director of the Concerts Spirituels for copying. However Le Gro on the excuse of pure memory did not order copies of the score. Sinfonia Concertanta was not performed and two months later Le Gro paid the fee to Mozart but did not give back the score. The concerto features of the Sinfonia become clearly apparent both in its structure and in the manner the composer develops the themes in every movement. The first movement represents a sonata Allegro where Mozart uses two and two playing of the main themes by the solo instruments. The second movement - Adagio, with one of the most famous and wonderful solo for bassoon. The Finale is written as a theme with 10 variations and coda. Each of the solo instruments develops a solo material and even horn departs of its traditional harmonic function and begins to play virtuoso passages.